Ed. Note- SuiteSports is thrilled to welcome our newest correspondent, St. John's (Shrewsbury) alum and current Quinnipiac journalism student Nick Beaudoin. Nick will be manning our Division 3 Central hockey coverage, and was kind enough to provide us with this preview. Welcome aboard Nick! As the 2017 MIAA hockey playoffs are set to begin, here is your Division 3 Central Mass boys’ preview. Let’s start with the favorites, the undefeated Shrewsbury Colonials. Entering the playoffs with a tie to Wachusett as their only non-win this season, the Colonials are poised to make a run back to the district final. After a disappointing loss last season to Algonquin in a shootout, head coach Steve Turnblom and his team know what it takes to get back and pull through with a win this time around. With three of the top five scorers in Central Massachusetts in Matt Ward, and the Quinlivan brothers, Anthony and Liam, offensive firepower will not be lacking for Shrewsbury. If rookie goaltender Pat Shaughnessy can stay hot, there is no team getting in the way of this Colonial squad. They are my pick to win the district championship. 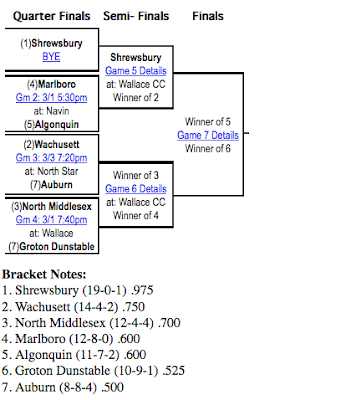 With a tight match up at the four and five seeds between Algonquin and Marlboro, the winner will have a huge test in front of them in Shrewsbury. I’m picking Algonquin in what should be a defensive battle. Both teams had trouble putting the puck in the net this season, and with solid defense, but lack of scoring, this feels like a 2-1 or 1-0 result when it comes down to it. 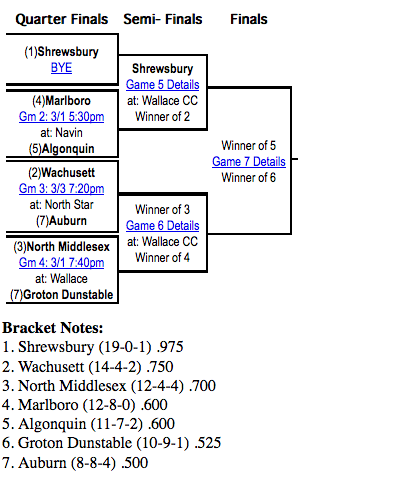 Looking ahead to the bottom half of the bracket, Shrewsbury’s biggest challenge will come against the team that gave them the most trouble this season; rival Wachusett. The Mountaineers, led by 40-point scorer Shane Sullivan, are eager to get the better of Shrewsbury, after suffering a 5-0 loss to go with a tie to end the season 0-1-1 versus the Colonials. If Wachusett is going to beat Shrewsbury, they are going to need good goaltending from Mike Putnam, and more balanced scoring outside of Sullivan. We saw this happen last season when Algonquin had trouble versus Shrewsbury in the regular season, but ended up getting outstanding play from seniors Mike Tascione and Alex DiPadua in the playoffs, and it resulted in a trip to the TD Garden for the Tomahawks. Can Wachusett knock of the Colonials with a similar formula? A team that may give Wachusett some problems however is third ranked North Middlesex, led by seniors Matt McCarthy and Don Frederick. McCarthy’s 48 and Frederick’s 37 points helped the Patriots reach a 12-4-4 mark this season. The Patriots had a close win over Wachusett in their only match up this season, winning 6-5 in a high-scoring game affair. NM should have no problem getting past Groton-Dunstable in round one, and look for the Patriots to give Wachusett a hard time in the district semifinals. Whoever wins the Central district title this year may have the best shot to make it to the TD Garden and represent the division as one of two teams battling out for the state title. It is hard to overlook what Shrewsbury has done all year and the returning experience they have. But, other teams will be gunning for their spot and may give them a hard time. Regardless, get ready for some great playoff hockey out of Central Mass.